I flew home on Sunday, and have spent the ensuing four days digging out from under 300+ unread emails and a huge work backlog. But I am almost back to normal! So what are my conclusions from my jacquard trip? Primarily, that jacquard looms are a lot of fun. I’m a bit sad that I didn’t have time to really explore the interesting things that can be done on a jacquard loom – most of my files were hastily constructed the night before weaving, so there wasn’t time to really think them through. But I got enough of a taste to conclude that yes, I want one, and yes, to me it’s worth a sports-car amount of money. I had been wondering about that, since I haven’t woven much this year. But it seems to me that a jacquard loom would address many of the frustrations I’ve had with weaving, mostly centered around the limitations of a shaft loom. And if I actually owned one, I could try all these fabulous ideas as they came, rather than having to make everything compress into a few days! I am working on a summary/feature comparison of the TC-2 and Jacq3G – planning to post it next week. I have not made a final decision on which loom to buy – and won’t until I actually write a check – but am hoping the feature comparison will help other people struggling to decide. Of the two, I like the Kodachrome one better – the text flows better with the image, the handwoven nature of the cloth is more obvious, and the colors are more vivid. So that is probably what I will order. I’m interested in your opinions, though! So please post your thoughts in the comments. What’s coming up? Well, this weekend should be interesting. I managed to score twelve pounds of sour cherries (which are very hard to find around here), so will be making candied sour cherries and sour cherry jam. I’m also planning to help my critique partner Lieven with a photo shoot, which should be intriguing, as I’ve never been to one before. If I have time, I’ll try to make it to the Northern California Surface Design Association meeting, but since Mike and I also have to clean up the house for my mom’s visit, that seems rather unlikely. She arrives Tuesday, and there is a LOT of cleaning to do! I also want to work on the book proposal. At Convergence, I met a representative of Schiffer Publishing, which is one of the publishers on my shortlist. He isn’t one of the editors, but he said he’d be happy to pass my proposal in to the editors. He’s also going to be back in the Bay Area in September – so I’m hoping to have the proposal finalized by then. That should be do-able if I don’t get too distracted. Weaving-wise, I am planning to cut off the color-study warp this weekend. That may be a bit involved since I am hoping to preserve the warp for my friend Carla – which means pulling it off in an orderly fashion rather than higgledy-piggledy as I usually do – but shouldn’t be too hard. That will allow me to beam the shadow weave warp and get started weaving that long-delayed project, too! They weren’t sure why I did anything so nonsensical as leaving in the first place, but were definitely happy to get me back. Belly rubs all around! I like the second one as well. It’s much more soothing to look at. More details about the Northern California Surface Design Conference – where, when, speakers?? As a former architect and urban planner, Kathryn has had another view of the foreclosure crisis. Using maps of the hardest hit properties in major cities across the country, she creates textiles that emphasize how these neighborhoods have changed. Kathryn’s Foreclosure Quilts have been shown all over the country and were exhibited at In*ter*face, the SDA Conference in San Antonio in June, 2013, where she was one of only a few artists honored with a solo show. An article about her and her quilts appeared in the Surface Design Journal, Winter 2013. More recently she is working with the hexagon form. She’s an avid gardener and I’ve seen pictures of the bountiful yield from her yard. Do not miss what promises to be a fascinating talk. If you would like to know the location (it’s Sunday the 27th, 1-4), email me – it’s at a member’s home so I don’t want to just post it here. Thanks for the info. I am intrigued by the quilts based on foreclosures. The Sunday meeting won’t work with my schedule. Always happy to see the cat photos on your blog. I actually prefer the phoenix because it’s so closely identified with you. The saturated rainbow of colors struck me as too ubiquitous even though the design composition is excellent as you and others have said. Naturally, I prefer the Kodachrome cards. They look faintly Lunatic Fringe Yarnsish.. Definitely the same page. While both cards are striking, the Kodachrome is more so; and the text (the important stuff) is easier to read. 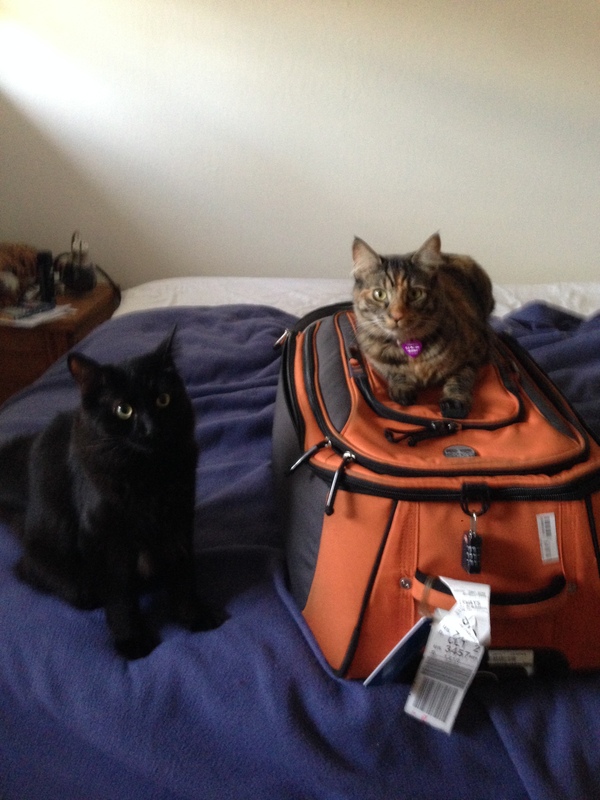 Clearly Fritz and Tigress are ensuring that you won’t be able to leave town in the near future! yes, I love the Kodachrome also. It was great to talk to you about old cats at CW Seminar. Kodachrome. Shall I keep your old one in my scrap book? 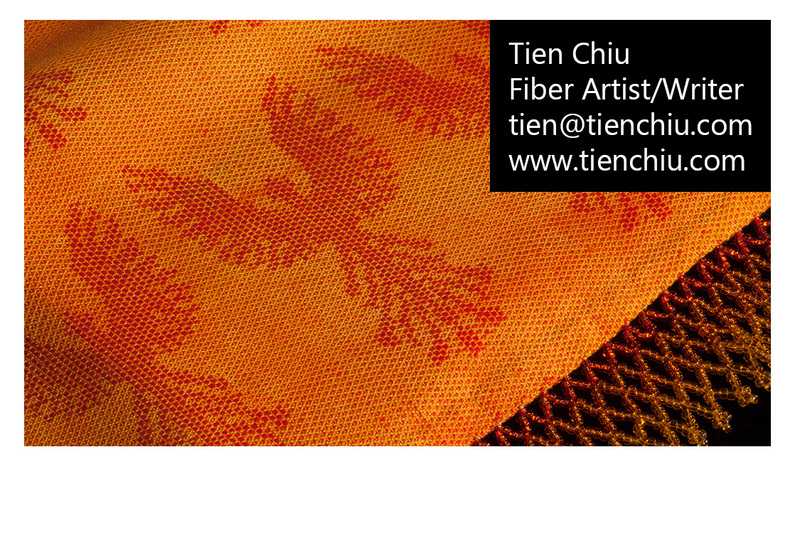 Tien, it’s been fun following your jacquard explorations! 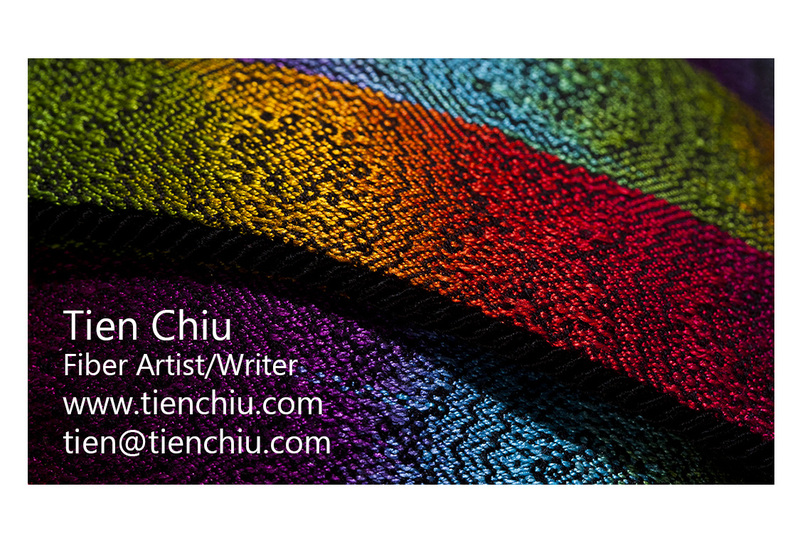 As far as business cards go, have you looked at Moo (moo.com) cards? They are high quality and set up so that one can print different images on different cards. 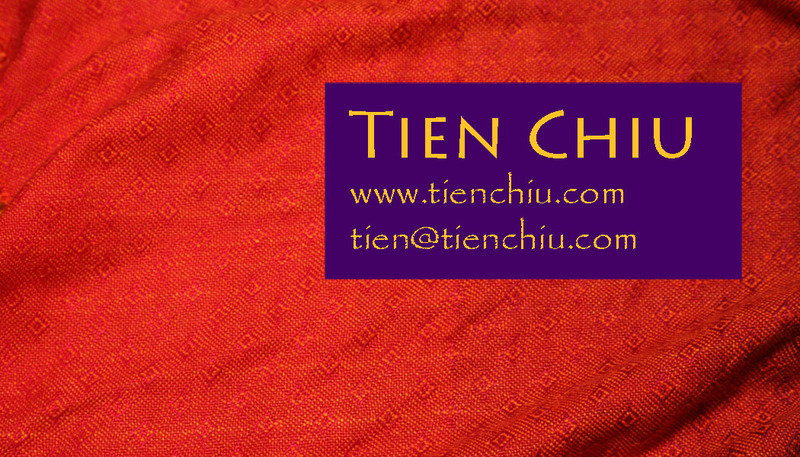 I am in no way affiliated with them but very happy with my business cards. I divided my pack into 5 different tapestry images. I use printsmadeeasy.com. and have done for many years… they do really high quality cards, and will help with your design, too. they even can be contacted over a weekend!! Thanks! I am probably going to order from catprint.com, as I’ve been happily ordering from them for awhile now, but it’s always good to have a second source just in case. Third source: Moo.com. Put your contact info on the front and photos of your amazing work on the back. You can have up to 100 different backs. Kind of like a portfolio in your pocket.